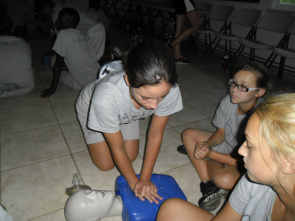 The purpose of Northeast Florida Camp Cadet, Inc., is to provide today's youth with the tools necessary to overcome challenges, instill strict discipline and bestow confidence and leadership abilities. Camp Cadet is a tuition free, one week event, staffed by local police and sheriff's departments from Clay, Duval, Bradford and Nassau counties. The police officers and deputies of these counties serve as counselors and instructors. The program is designed to give boys and girls, ages 12 through 15, a better understanding of law enforcement activities while living in an atmosphere similar to a police training academy. It is held at Northfork Leadership Center in Middleburg Florida. Heavy emphasis is placed on leadership by improving self-discipline, building self-esteem and confidence through teamwork and making new friends. Camp Cadet was originally formed in 1970 by Trooper Albert R. Vish, of the Pennsylvania State Police. Trooper Vish along with Troopers John Prandy (deceased), and Robert Price (P.S.P. retired) were instrumental in establishing the first Camp Cadet in Butler County. Since 1970, Camp Cadet programs have been established in approximately 30 other counties in Pennsylvania. Officer Kimberly Robinson of the Green Cove Springs Police Department was formerly a police officer in Pennsylvania. Officer Robinson was the first President of the Allegheny County Camp Cadet. After assisting Trooper Robin Mungo in Allegheny County Pennsylvania, she decided to start a Camp Cadet in Northeast Florida. All instruction is presented via classroom and hands on training.